KrystleDawn posted a challenge for tatters to show pictures of their tatting corners. I have to admit I'm a poster child for "tatting in my pocket". I tat anywhere and everywhere, I tat at the computer and I draw tatting patterns at the computer. The current tatting clutter on my computer desk is mostly comprised of the test tatting of the pieces from the Design-Tat course. The 3 balls of thread are for a bookmark I'm designing. Most of my tatting supplies are stored in a 6 foot by 3 foot cabinet and in 3 drawer filing cabinet wedged in beside it. The filing cabinet holds the size 10 threads, that I don't use very often. People keep giving me bags full of size 10 thread and this is just the coloured threads. I have a garbage bag full of white balls stored in the closet. As you can see the tall cabinet holds several smaller containers with drawers for different sizes of thread, my small collection of tatting books , the blue chest in the middle holds embroidery threads and the boxes beside it hold miscellaneous tatting supplies like beads, bangles, findings, hankys and other things to put tatting in or add tatting to. It also houses the binding machine and supplies for book publishing. The dresser is an in between station where pieces get dropped while I think about how to proceed with a pattern or where they sit until I can mount them on my 3 foot square blocking board which is stored behind the cabinet. Small things can be blocked on the ironing board, but larger items, like doilies, hang off the edges so they need a bigger area. The bed makes a large surface at just the right height for holding the blocking board while I pin things out. So finished tatting often sits on the dresser until I have the time to block it. It gets thrown back on the corner of the dresser until it can be scanned or photographed and again until the pattern gets drawn out if I haven't done that first. It gets put back on the corner when it's done until I either give it away or find some place to store it. That's what this mixed stack of stuff is doing here. 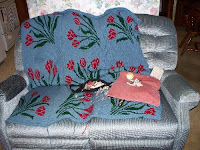 The corner where I do most of my tatting is here, on the love seat. The light is appalling, but I tat as much by feel as by sight, so it isn't a big issue unless I'm using size 80 an a dark colour. I mostly only need to see to do joins. I have 2 projects sitting there at the moment, a motif I'm working on in pale yellow where things have gotten to the point where it needs my undivided attention and the bookmark that requires less attention in pink. The white and green threads will get added later, they're still upstairs by the computer. When the weather is nice I grab the parrot and go sit on the bench outside to tat so that both of us get a bit of fresh air, so I guess you could say that my tatting corner is really all over the house. Krytal had a great idea! It's so fun to see everyone's tatting spaces. I didn't know you had a bird; I just blogged about my parrot today. This is fun! I tat by my computer, too! Actually...I bring my laptop to where I tat, LOL! That's so nice to have all that storage space for your tatting. Does your parrot try to steal your tatting thread while you are tatting? I'm stopping by to thank you once again for having such a profound influence on my life. The 25-Motif Challenge (and my starting my blog) re-ignited my interest in tatting! Following all the tatters' blogs is part of my daily routine. And it's so great to have a dialog with others via the comments. I'm hoping to start doing more 'current' tatting projects for the second round of the 25-Motif, although I still have a lot of 'old' tatting to show. I'm enjoying seeing where everyone tats, and I like to show the photos to my DH so he can see that I'm not the only one with lots of tatting 'stuff'! Thank you so much, again, for all you do for the tatting world.